When you commission or buy a sculpture from Body Casting Sydney you are investing in an original Justin Robson artwork. Justin is an award-winning artist and sculptor with 30 years experience. Justin has completed many body casting sculptures for clients, friends and family over the years. 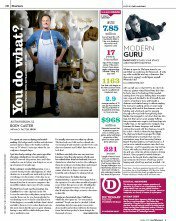 He set up Body Casting Sydney with his partner Jane Floyd in August 2009 to meet an increasing demand for this type of artwork. In the past, only the affluent could afford to commission a portrait sculpture by an artist. But these days everybody can have the privilege of immortalising themselves – or their loved ones – in sculpture. Body casting is an artistic method that makes this much more affordable and accessible. We guarantee the quality of our product and will provide a full refund if you are not satisfied. We build upon our reputation for customer satisfaction every time we receive a commission. We believe we have an obligation to maintain the trust of our customers and ensure that every sculpture conforms to our high standards. Our priority is to provide a service that meets or exceeds our customers expectations. Body Casting Sydney is located in Brookvale at the artist studio of Justin Robson. The first step is to make a mould of the body part. This takes about 15 to 45 minutes depending on the size and complexity of the body part. It involves covering the body part with quick setting gel (alginate) and then plastering the outer surface of the gel to support the mould. The second step is to fill the mould we have made with with casting material – we mostly use a gypsum-based cement stone, but we can also cast in material such as cold cast bronze or resin. This can take a few weeks depending on the material used. The final step is removing the cured casting from the mould and detailing it to a high-quality finished product. This can take a further week depending on the finish desired. Justin Robson studied art at the National Art School. He secured an apprenticeship as a commercial artist in 1981 and has been working as a sculptor ever since. You can find out more about Justin at www.justinrobson.com.au. For more than 35 years, Justin Robson has had a career making sculpture for exhibit, sale and commission. He uses a variety of media, including bronze, stone, metal, foam and wood and his work has been showcased around the world. Justin is experienced in a wide range of sculptural forms, but has a passion for figurative and portrait sculpture. Justin’s commercial artwork has also featured in many film and television productions. The most notable being the rice ads for which he received numerous awards around the world. He also won awards for the O’Brien Glass “fish tank” commercial. Justin is also the owner and director of Watusi, a props and model-making company for film and TV. Justin says making something out of nothing and giving it texture, form and expression is an amazing ability and a privilege. “After 30 years of sculpting, I have developed a good eye for detail, many techniques and an ability to translate ideas into something tangible,” Justin said.